Dr. Pete O’Donald received his undergraduate education at Lamar University in Beaumont, TX, graduating in 2005. After graduating, he worked for Motiva Enterprises in the petrochemical refinery in Port Arthur, TX. Five years later, he left Motiva Enterprises to attend medical school at William Scholl College of Podiatric Medicine in North Chicago, IL. 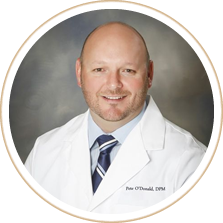 After graduating in 2014, he completed three years as a podiatric medicine and surgery resident at the Charlie Norwood VA Medical Center in Augusta, GA.
Dr. O’Donald is affiliated with the Medical Center of Southeast Texas. He specializes in wound care, limb salvage, bunions, hammertoes, and forefoot surgery. Dr. O’Donald has been in practice since 2017.